A spectacular jam from a rare variety of berry. In his search for the ideal domesticated strawberry, Justin Rashid, founder of American Spoon Foods, discovered Gary Bardenhagens' centennial farm, a series of rolling green hills perched above Sutton's Bay on Michigan's Leelanau Peninsula. He sampled at least a dozen varieties of strawberries before falling in love with the Early Glow, a small, low-yielding berry so difficult to grow that few local farmers even planted it. 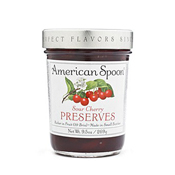 That berry, from that same farm, has been the basis of American Spoon Foods award-winning Early Glow Strawberry Preserves for over 30 years. This is no ordinary strawberry jam. Made with berries and pure cane sugar only, each jar captures the authentic taste, striking aroma and succulent texture of freshly picked strawberries.